Graph of the Week: Body Weight in the United States - Part 3, "Contributing Factors"
Body Weight in the United States - Part 3, "Contributing Factors"
"To our knowledge, there has never been an essential carbohydrate discovered. Every carbohydrate your body needs can be made from either protein or fat." Wow - powerful words, indeed. This is not to say that carbohydrates do not add healthy value to our bodies (such as fiber); rather is puts their contributions into perspective. This makes looking at the above chart very disturbing as it shows we've been wolfing down carbs more and more for quite some time - a nutrient that we simply do not need in large quantities, much less ever increasing quantities. If you eat ten pounds of cheesecake in a day, you will gain weight (and then promptly lose some of that as you throw up). Your body just cannot deal with those extra calories and is forced to do what it does best - store them as fat (those that didn't end up on the floor). This certainly holds true when eating carbs since they are mostly non-essential. The end result will be the same - a new, larger wardrobe. Speaking of carbohydrates, let us turn our attention to caloric sweeteners (sugars that have calories). 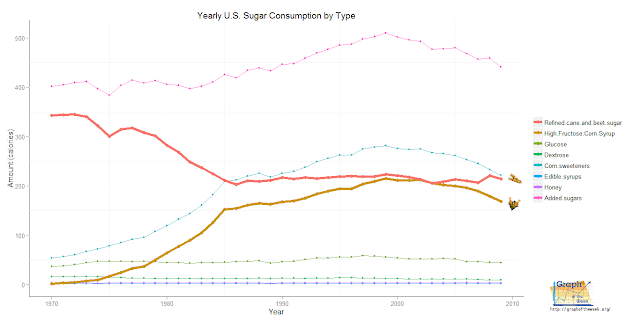 Before 1970, nobody ever heard of high fructose corn syrup (it had only become viable around 1967). Humans had never encountered it before, so any long-term effects from it were unknown. Cane sugar, on the other hand, had been around since 6000 B.C. and was a primary sweetener of the time. It's effects were well-known given its (extremely) long history in the human diet. So what caused this mysterious new sugar to show up? Due to government subsidies encouraging corn crop production for Ethanol, so much corn was produced that something had to be done with all of the excess. Enter High Fructose Corn Syrup (HFCS) - a product which could be made from all that extra corn. At around the same time the U.S. government imposed tariffs on sugar imports, setting the stage for a significant change in our diet. "I wasn't too political at the time, being kind of a hippie artist housewife, in the hills of northern California, but I had read that they were subsidizing farmers not to grow certain crops and that imports of certain foods were being limited. One of those was sugar which had been replaced by high fructose corn syrup! Lobbying power, anyone?" Thus, the replacement of sugar with HCFS began as the chart above shows. Estimates show that Americans now gobble down anywhere from 35 to 60 lbs of HFCS per year versus virtually zero lbs in 1970. Coincidence or not, this corresponds to the same time frame in which rapid weight gain has occurred in the United States. In 2011 the oft-maligned corn Ethanol subsidy was allowed to expire due to various pressures. Interestingly, the rise in products containing sugar in place of HFCS (such as 'Throw-back' Pepsi) began to emerge around the same time. The public is beginning to get wind of HFCS-is-bad-for-you relationship, so food manufacturers are slowly and quietly (re)introducing products on the market replacing HFCS with sugar as the cost to do so becomes more manageable (the graph above shows this recent trend). But does HFCS make you fat? Almost assuredly so. Rats, when given HFCS instead of sugar (while caloric intake was the same) gained significantly more weight - to the point of obesity - in every single case. According to the American Journal of Clinical Nutrition, all animals given HFCS will gain weight when compared to control subjects - every single one (and also in humans - scroll down to section 3 in the article cited). Thus, the evidence is strong in relating HFCS consumption with weight gain. Additionally, HFCS is a chief suspect for the rise in metabolic syndrome in the U.S., causing all sorts of nastiness such has heart disease, diabetes and strokes. In fact, it is difficult to see any beneficial health effects from HFCS at all. In part 2 of this series, it was noted that leisure-time activity has gone up. But, not unlike attempting to "counter a pack-a-day smoking habit by jogging", our occupational-time (work-time) activity has gone down. And guess where we spend most of our time? Medical Billing and Coding created an excellent info-graphic which really gets the points across about the dangers of sitting too long (shown at left - click to see full size). "But what if I told you that even if you adhere to the government's guidelines for daily exercise and work out for thirty to sixty minutes per day three to five days per week, you still may not be doing enough to counteract the damage that sitting for extended periods does to your health?" He elaborates on the dangers of sitting asserting that it is worse for us than "smoking a pack a day." It's sobering news when we learn just how little we move while in a chair as described in this New York Times piece with Dr. Levine. Indeed the "chair-based life style" not only makes us overweight, but it reduces our ability to counteract weight gain - a vicious cycle (an economic term which plays well here). In other words, the more you sit, the harder it is to un-do the effects from it. Although this extremely well-executed study was performed in Europe, it applies to the United States as well. In it, thirty-year trends show an increase in leisure-time activity with a significant drop in occupational-time activity - for both men and women. So while more people are jumping, running, spinning, climbing and dancing in gyms all around the country after work, we are sitting on our butts more during work. And the during work part is killing us faster than the after work part can save us. In Part 1 of this series it was shown that Americans are getting fatter - no surprise there. Part 2 highlighted some of the major non-factors in weight gain while this 3rd installment provides (strong) evidence to the causes of increasing fatness. While each section of this article uses a different data set, it would be irresponsible to directly link these factors (as presented here) to weight gain. However, the evidence is nearly overwhelming and ignoring these factors will most likely lead to a lifetime of poor health, disease and weight problems. We are in control of our own destiny which includes our health. Trusting your health to the government (or any one entity) will lead to disastrous results - just look around to see proof of this in action. At the end of the day, do what works for you - even if in direct opposition to various health claims, studies, articles (such as this one) and advice. Each of us, while sharing many similarities, is unique and wonderful and responds best to our own internal guidance. That being said, a good place to start would be to reduce carbohydrates, eliminate high fructose corn syrup and get out of the chair whenever possible. 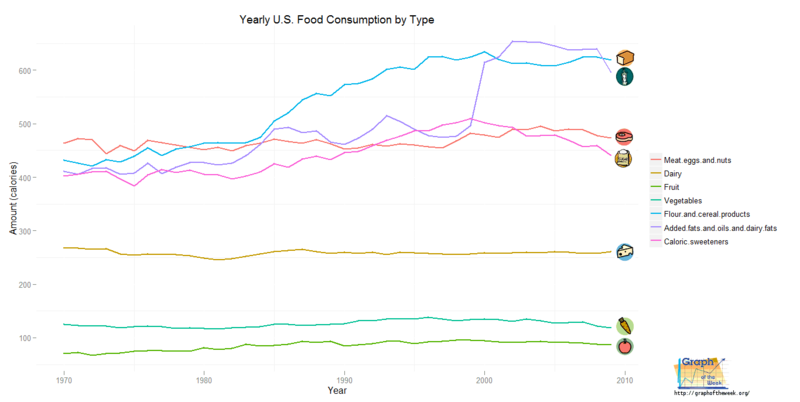 1) Usage of HFCS has been trending downward as of late - will this continue? 2) People are working long hours at sedentary jobs to 'get ahead' - at what cost to their health? 3) The U.S. government provides subsidies for specific crops - is there a way to assist farmers without this restriction?